Yesterday, the co-founders of ANOVOS published an article on their website explaining what has been going on with regards to significant delays to many of their products pre-ordered by customers. The cause, they say, is due to “complex burden of accuracy”. The company is making some adjustments to be better at getting products out into the hands of customers. As a customer who has several products pre-ordered that has been delayed (some of which delayed quite a bit…), I wanted to write a letter of support for the company because their products are simply stunning and amazing when you get them and completely worth the wait. So, who is ANOVOS? ANOVOS is a small company that specializes in producing screen-accurate and highly detailed replica costumes and props from Star Wars, Star Trek, Ghostbusters, Marvel and a few others. Their products are very popular, especially with Star Wars and Star Trek fans with many fans wearing their product to conventions. Through their licensors like LucasFilm or CBS, they get access to the exact costumes and props used in the TV and movies to create their products allowing them to truly specialize in creating products that are incredibly accurate. And this is what attracted me to purchasing ANOVOS products: accuracy. As a Star Trek fan – I’ve always wanted to own screen-accurate uniforms from the TV shows and movies. When it comes to Star Trek, I am extremely detailed orientated. DETAILS MATTER! A Star Trek uniform from Rubie’s isn’t going to cut it for me. I want to feel like what I’m wearing is exactly what they wore on the show. When ANOVOS came to the table with their uniforms for Star Trek – I was excited someone was finally doing this and specializing in accuracy. 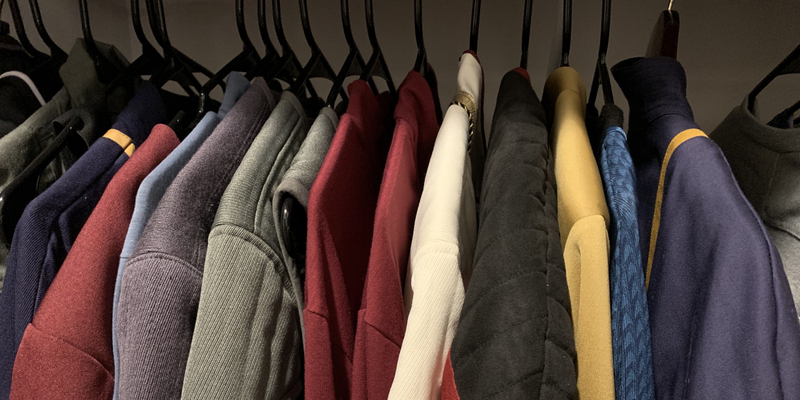 My very first ANOVOS purchase was the Captain Picard jacket as seen being worn by Captain Picard in the later seasons of Star Trek: The Next Generation. And I was blown away by the quality and accuracy. I wore it around work like Captain Picard wore it around the Enterprise. The way ANOVOS works is they solicit a product and then open it up for pre-orders. Usually when they solicit the product, it’s in the prototype stage with development of the product on-going. The pre-orders are limited to a certain number or sometimes in waves. Filling that number ensures they can produce the product. Often, you’re in a waiting game on a product you pre-order as ANOVOS develops the product for manufacturing. I currently have several pre-orders – some of which I made nearly two years ago. What has caused delays in getting products to customers is the process of producing these products can ben immensely complex due to the focus on accuracy. ANOVOS hopes to make changes that avoids having to decrease their focus on accuracy but shrinks the time it takes to get products out to customers. I completely support ANOVOS in their efforts. But I also don’t mind waiting. The products I’ve purchased from them have been amazing. I mean, simply incredible. I’m not upset I have pre-orders going back almost 2 years because I know what I’ll get will be stunning and reflect incredible quality. The main issue for me is simply lack of transparency on the ongoing development of the products I pre-ordered and resulting delays. I want to see ANOVOS do a better job communicating with customers because I think that will make a HUGE difference. When you order products from ANOVOS, you’re getting the best-of-the-best so its best to reset your expectations of having something be immediately available but know you’re getting something awesome. I am so excited about these products and can’t wait to show them off! ANOVOS has my complete support and as long as they continue to make awesome costumes and props from Star Trek and Ghostbusters, they have my business. Like you, I too defended them on social media when my order was still under two years old. At that point you can still convince yourself that it’s not that bad, that it will soon be here and be worth every penny (more than three hundred thousand of them in my case). But then it’s no longer ‘almost’ two years. That date comes and goes. Eventually it’s almost three years. Then even that anniversary passes and you find yourself nearing four years with still nothing to show for it. You look back on the status updates telling you the item is finished and expected is expected to ship in just a matter of weeks, and then realize that even those updates are more than a year old now and they have not provided a single sentence of new information since then. This isn’t hyperbole; it’s happening to some of us right now. There is absolutely no excuse or defense for delays that are this severe, or the level of customer misdirection and radio silence. We’re not talking about a product slipping its deadline by a few months, but by several years with no transparency provided and in some cases no refunds that were promised. One or two positive anecdotal experiences with the company do not come close to outweighing the hundreds who are actively having issues as illustrated by the Better Business Bureau. Quality and accuracy can’t even make up for it, since none of that matters if the product you paid for never arrives. It’s not like unlicensed vendors and artisans aren’t also offering screen-accurate quality outfits that are custom tailored to you in just a few short weeks or months, often for cheaper. Meanwhile threads on TheRPF cast serious doubt on the quality of some Anovos products which have issues that shouldn’t exist given their price tag and extended production time. You might still receive your order in due time and be content with it. The Star Trek stuff they offer are mostly just shirts and small badges or trinkets and as such haven’t seen anywhere close to the level of delays that their Star Wars costumes and kits have seen. But the problems with this company are very real and extremely valid, and they will not get another dollar from me until they give me the thing I ordered that they said would ship in 2016.